"A random landing in London and a trip to the Savoy Hotel yield unexpected results for the Doctor. Tea, scones, an American general who knows far too much, and the threat of a Dalek invasion of Earth. It seems the Doctor's deadliest foes have woven a tangled web indeed. And in order to defeat them, he must cross the forbidden barriers of time and walk into the very centre of their latest, most outlandish scheme of conquest." What did you think? What happened when he crossed the barriers of time? Does anybody else imagine an epic Lawrence of Arabia landscape with that phrase? Just me? This one was a little campy for me. It was too long and wasn't totally capturing my attention. I like that it focuses again on the Dalek invasion of earth in the 22nd century. It's definitely a story that a lot of things refer back to, and here history has been changed and somehow we end up with all these extra companions from....largely American wars. Which made no sense to me honestly. The addition of these characters was sort of fun, but the whole thing I was just thinking that I would just rather have a different story altogether that's a Doctor-companion story. Still a fun listen, just not my favorite of the bunch. I kind of enjoyed the fact that it explored American wars, but the characters felt really stereotyped and annoying. Liked how it started it off but it trailed off about halfway through. Very timey-wimey. Not quite sure what the Greylish thing was at the end. 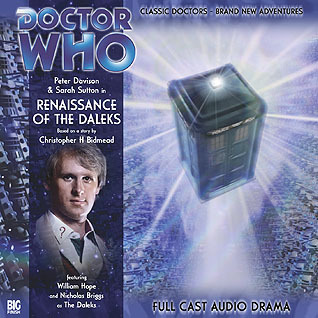 Not one of the best audio dramas. Daleks just kind of felt thrown in there and weren't really threatening at all. This started off with a lot of cool ideas: toy Daleks, mixing in with the American wars, people trying to prevent the Dalek Invasion of Earth. Then it all became very dull. It was too much of characters not knowing what was going on, not knowing what was going on and then long explanations of what's going on before they didn't know what was going on again. One small thing I liked was how they used songs to convey messages, much like the Underground Railroad. Once again, Nyssa was just there for sci-fi mumbo jumbo. Also the character of Alice, the one from Nam, was very very annoying. So this was a bit lame after a bit which is unfortunate.